Amulet VST to Direct-x adapter - GEt this if you want access to LOADS of FREE direct-x fx for your pc - check it out imeadiatly !!! They claim to have tested most plugs with the Cake, Logic's, Acid, Soundforge etc etc.... and they work ok.... anyone comments ?? are they trying to sell the software now? can someopne please send me the freeware version? "MIDI automation of all plug-in parameters - if your DAW software supports MIDI, you can automate all parameters of the VST plug-ins. You can also tweak them in real-time using a hardware MIDI fader box such as a Peavey PC-1600 or Doepfer Drehbank." 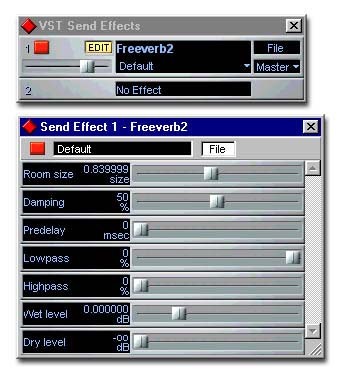 "VST Instrument support - use Model.E, Neon, LM-4 and others in your non-Steinberg DAW software." V2 costs $60 (free upgrade for old V1 users). There's also some other version designed for Soundforge & Cool Edit Pro. I have use the V1 with Logic Gold 3.5 (PC) and it works great with all the freebie plugins I have tried. I plan to download the upgrade asap and try the new features :-) The latest Logic might support Cubase plugins on the PC now though, I dunno. Dangit the line breaks don't work here? Now now, mummy will smack your bottom.